Say hello to crisp sea breezes, luscious green mountains, and luxury homes. Say hello to a life in Kauai. 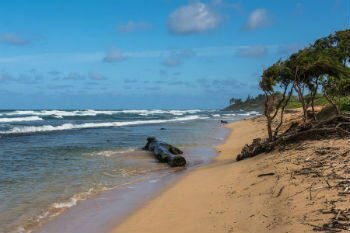 Start your journey to owning a Kauai home for sale by registering with Anne Eliason – Kauai real estate pro today. Timbers Resorts proudly announced their plans for Hokuala homes for sale in late 2015. Taking over 450 acres of land on Kauai's southeast coast, Hokuala real estate is set to become another crown jewel in the Timbers Resort portfolio, matching the provenance of their best-in-class European resort the Castello di Casole and the #2 in the USA resort The Sebastian in Vail. Hokuala homes for sale offers residents and guests completely unobstructed views of Kauai's famously stunning shores, which are framed by Kauai's verdant mountains. One of the greatest things about owning a piece of Hokuala real estate is that you will own 100% of your luxury residence, according to Timbers Resorts. Hokuala's Residence Club is designed to be a flexible and convenient way to purchase a luxury vacation home in Kauai while keeping costs at an affordable level. Often referred to as fractional home ownership, the Residence Club provides the benefits of owning a luxurious vacation property in Kauai without the hassles of permits and other issues that come with owning a second home in Kauai. Each home in Hokuala's Residence Club represents a deeded Hokuala real estate purchase. This means that you as a homeowner in this prestigious Kauai neighborhood can gift or resell your portion of prime Kauai real estate. With your ownership, you should be assured that you can enjoy several weeks per year enjoying the famous Kauai lifestyle and the wonderful amenities that come with owning Hokuala real estate. For those who would rather purchase Hokuala real estate outright will be pleased to find that the resort does have a select number of Kaiholo and Maiula style luxury homes for sale. Doing so, allows you to access the benefits of private ownership including the comfort of your own space, the flexibility of when to stay, and practicality of being able to design the space so that it fits your lifestyle in Kauai. An oceanfront residence at Hokuala, Kauai also allows you to open your home to family and friends year-round or enter it into Timbers’ rental program. Another way to own your own luxury home in Hokuala is to purchase one of the sought-after Island Townhomes. Along with all the benefits listed above that come with owning an Oceanfront Residence at Hokuala, an Island Townhome also allows you to access pre-arrival grocery shopping services, daily housekeeping and turndown service, and maintenance of your property's interior and exterior. Picturesque views, open spaces, and private lanais are just some of the crème de la crème features of the Maliula homes for sale. These properties traditionally have three bedrooms, which makes them perfect to show off to friends and family. You’ll also find hardwood floors in almost every room including the kitchen, living room, and the master bedroom. In the kitchen, homeowners will be pleased to find a generous selection of Thermador and Bosch appliances as well as an integrated wine cooler. To top off these properties, when you arrive at the Hokuala resort in Kauai, you can leave your car at the porte-cochere and the resort’s valet will take care of the parking for you in your private parking garage and secure storage area. A step up from the Maliula, home hunters in Kauai will be thrilled with the lifestyle that the Kaiholo homes offer you. Spread out across two levels, the three or four bedroomed properties offer as many as three private lanais, all of which is spread out over 3,100 square feet of living space. Many of the Kaiholo homes have a near cliff’s edge view that overlooks the twin infinity pools and out to the majestic Pacific Ocean. The main level lanai is designed to make the most of the views when entertaining friends and family members with the built-in barbeque and spacious floorplan that allows for a space to relax as well as a formal outdoor dining area. Through the stacking glass doors and into the property, there are hardwood floors in the living room, kitchen, and master bedroom, much like the Maliula, as well as marble vanities, custom cabinetry, and the high-end Thermador Masterpiece appliances that are the piece de la resistance of the Kaiholo’s well-appointed kitchen. Think you’re ready to find your dream home for sale in Hokuala? Contact Kauai Real Estate Pro, Anne Eliason.